I CREATE CUSTOM ILLUSTRATIONS OF PEOPLE'S HOMES. ALL WORK IS DONE IN WATERCOLOUR FROM PHOTOGRAPHS AND TAKES ABOUT 4 WEEKS. PRICING BELOW IS FOR AN ORIGINAL ILLUSTRATION ON 9X12” PAPER. A PERFECT WAY TO CELEBRATE A HOME YOU LOVE, GIVE A SPECIAL GIFT, OR CREATE AN ORIGINAL HOLIDAY CARD. WHAT MAKES A STRONG ILLUSTRATION? ILLUSTRATIONS WITH LOTS OF DETAIL - ESPECIALLY GRAPHIC DETAIL - READ WELL AND GIVE THE IMAGE A LIVELY ENERGY. IF THERE ISN’T MUCH EXISTING DETAIL IN A PHOTOGRAPH, IT CAN BE ADDED IN THE FORM OF PLANTS AND FLOWERS, RUGS, PATTERNED ACCESSORIES. COLOUR ALSO HELPS. IF YOU HAVE A PET, INCLUDE THEM TOO! FOR MORE INFORMATION, PLEASE EMAIL hello@virginiajohnson.com. 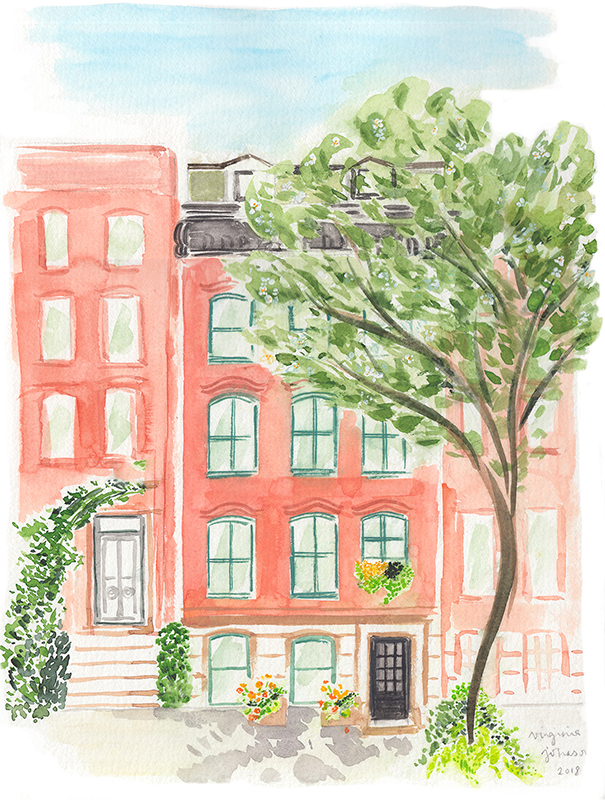 An elegant brownstone in New York’s historic West Village. Trailing vines and flowering window boxes add colour, and a Callery pear tree breaks up the flat plane of the brownstone facades. An apartment in Paris created for a client with a passion for photography and geometrics. While much of the space is creams and grays, there is enough colour and pattern to anchor the painting and move the eye around. The owners rent out the apartment when they are away - contact @saint_pourcain. 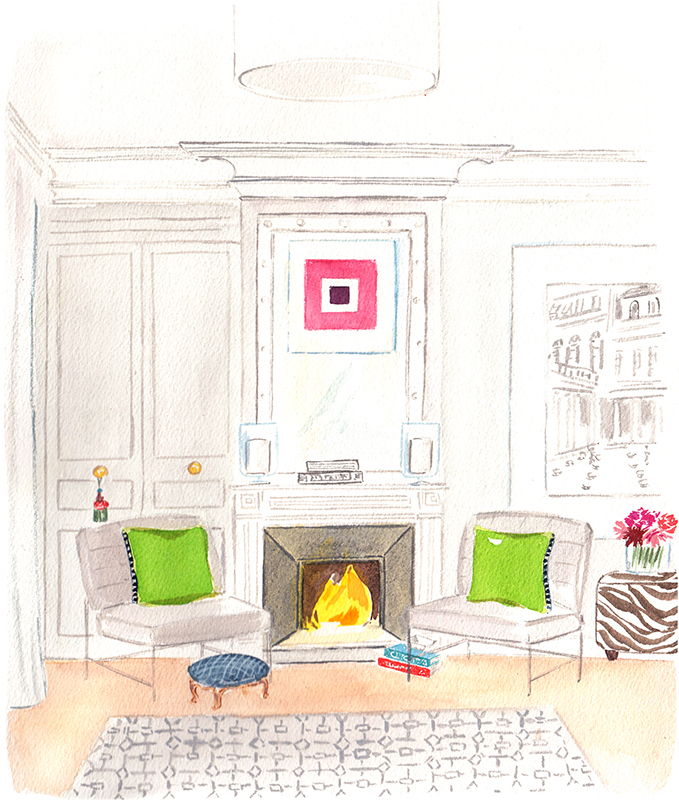 An illustration of an apartment decorated by Miles Redd, commissioned for New York Magazine. This interior works well for illustration because it has lots of colour and decorative detail (the pattern on the rug, the dots around the blue screen, the shapes on the wall), which draws the eye around the room. Decoration tends to render better than monochromatic, all-white or streamlined interiors with my illustration style, but this can also be added in later. This illustration was commissioned for a holiday card. The building has a classic, pre-war facade with lots of opportunity for detail in the windows and iron railing, but was mostly monochromatic. 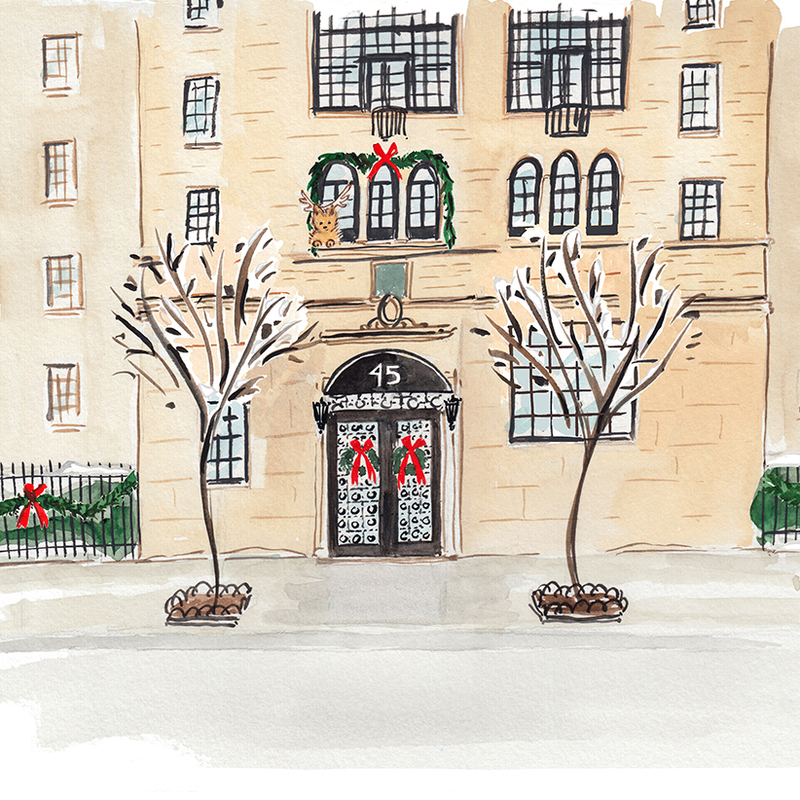 I added colour through holiday details like cedar garlands, wreaths, and ribbons, and we included the owner’s little dog peeking out from their second-floor apartment. 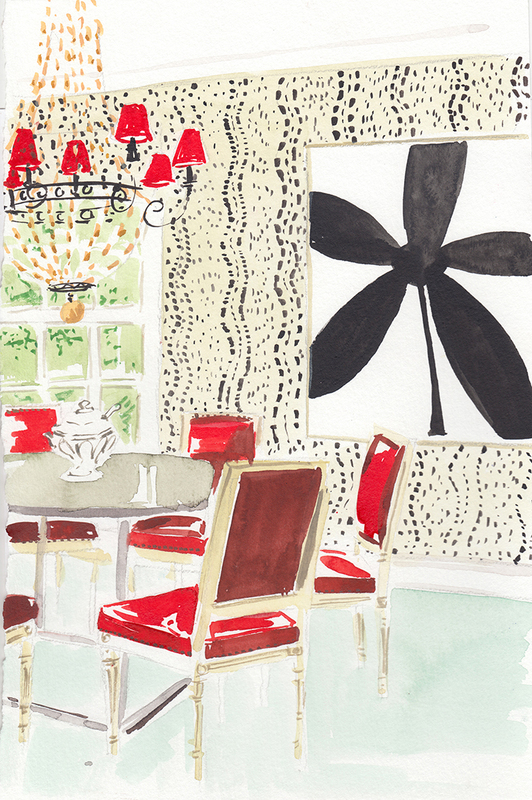 Lots of pattern in the wallpaper and bright accents of colour make for a fun illustration. For New York Magazine. 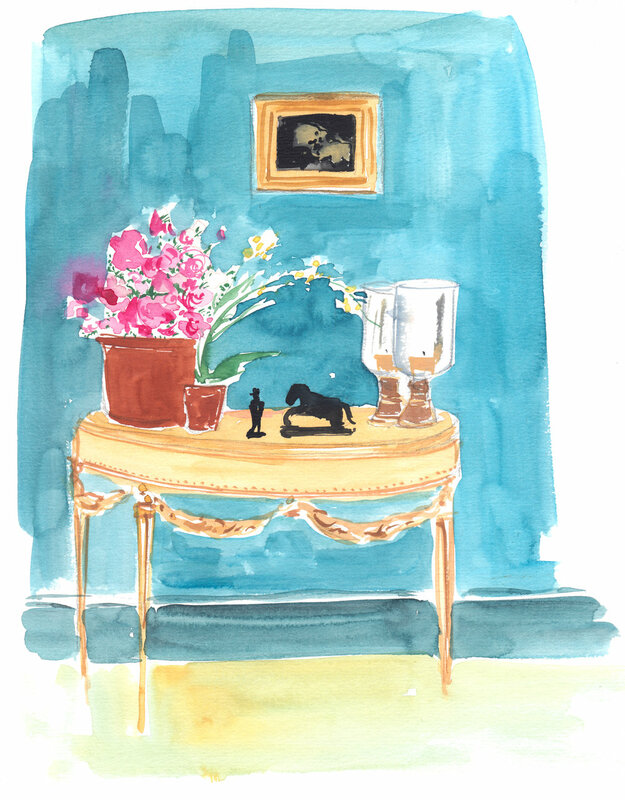 A small vignette, in this case an entry I painted for Deborah Needleman's book The Perfectly Imperfect Home (Clarkson Potter, 2011). Sometimes a small corner contains more charm than the whole house! 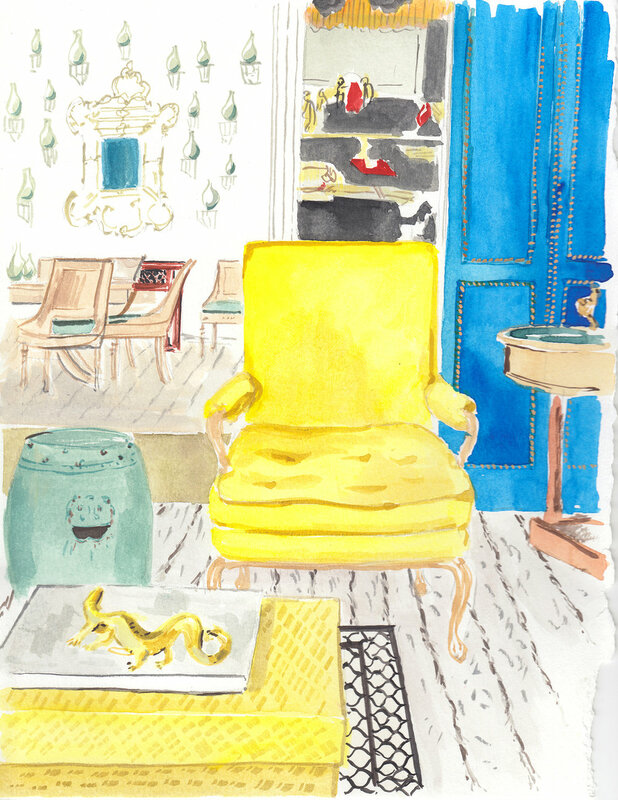 A rendering of John Derian’s new West Village shop. A relatively simple, white facade is given life with the overgrown wisteria vine and bright hollyhocks in little pots. This illustration was commissioned to run alongside a story in The Wall Street Journal. The magical living room of Villa Santo Sospir is decorated with murals of Jean Cocteau. It was a residence until 2016 and is filled with the ephemera of the family who owned it for more than 70 years. This illustration appeared in my book, Travels Through the French Riviera (Artisan, 2018). The clapboard cottage of a family friend on the northern shores of Lake Erie. The charm of this cottage is as much on the outside as the inside. I decided the landscape around the house - the century-old trees and the lake right out front - were essential to include in this house portrait to convey the drama of the surroundings.